I work for a large health care provider and we are interested in finding a way to replace all the paper forms our health care workers complete out in the field with an electronic solution? This is a very timely topic. Many industries are in the process of revamping paper-based workflows to increase productivity and reduce costs. We have the perfect solution to do just what you requested! It is called the eWriter. The eWriter is a business-class tablet that’s as lite as a small clipboard, as thin as most paper notepads (less than a third of an inch in profile), and connects to your corporate workflows via WiFi or Wide Area Network cellular connection. It provides the smoothest writing experience and fast-forms processing on the market today and maximum “untethered” portability for carrying the equivalent of an entire forms binder from point-to-point. Data can be captured via stylus, camera, voice recorder or soft keyboard. 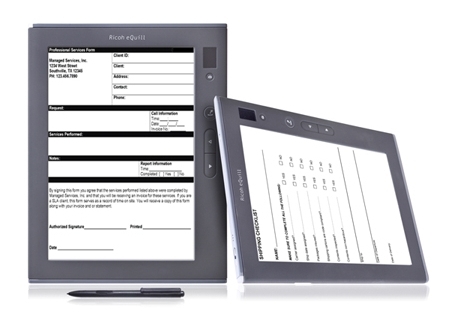 Utilizing the latest in electronic-ink display technology, the eWriter provides a crisp black-and-white 9.7 inch screen with the same appearance and readability of printed paper.